Couscous…a strange name for a food item that I hadn’t heard of until a few years ago. What is it? It’s a semolina wheat granule that is a dietary staple in Northern Africa. When steamed or boiled, it’s used as a base for meats, vegetables, or sauces. 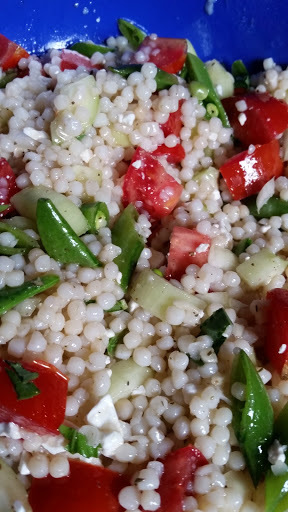 Couscous easily absorbs the flavors it is mixed with which makes it a great food to mix with a salad. I really hate giving ingredients for this salad because you may add anything you like or have on hand! Use your imagination! You could use different dressings as well…sweet, spicy, tangy. This is the salad I made today. Add all the ingredients into a jar and shake vigorously until well blended. Set aside. Prepare the couscous. In a large saucepan, bring the water, oil, and salt to a boil. Add the couscous, return to a boil, reduce the heat and simmer 8-10 minutes until the couscous is al dente. Drain and rinse with cold water. This will do 2 things – stop the cooking, and rinse the starch from the grains to prevent it from becoming sticky. While the couscous is cooking, dice the vegetables and add to a medium bowl. 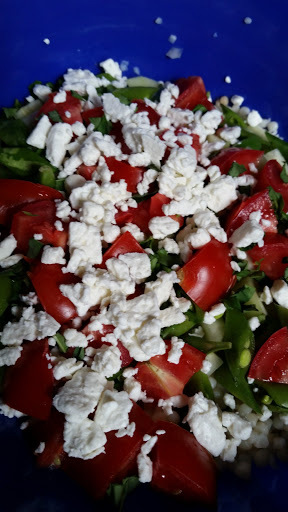 Add the couscous, feta cheese, fresh herbs, and dressing. Mix well. This can be eaten chilled or at room temperature. I can hardly wait until summer! This will be wonderful with fresh squash, green beans, peppers, mushrooms, melon …oh my!